Pope Francis promotes religious pluralism in the video below. Instead of teaching, which is his duty before God, that the only true religion is the Roman Catholic Faith and that all must convert to the Catholic Church for salvation (and if one doesn’t and it is his fault, then he will burn in hell forever), he spews this nonsense. Bishop Fellay and his neo-SSPX will be just another animal in the zoo of religious pluralism. Let us pray that Pope Francis returns to the Faith of Sts. Peter and Paul. Ambrose Moran: Is He Really a Catholic Priest? From the evidence I’ve seen (and the lack of convincing contrary evidence), I conclude, with a prudential certitude, that Ambrose Moran was not ordained a Catholic priest. Was Archbishop Marcel Lefebvre the Holy Prelate Prophesied by Our Lady of Good Success? “It was not only the good Pope Leo XIII who said these things, but Our Lady prophesied them as well. Just recently, the priest who takes care of the priory of Bogota, Colombia, brought me a book concerning the apparition of Our Lady of ‘Buon Suceso,’ – of ‘Good Fortune,’ to whom a large church in Quito, Ecuador, was dedicated. They were received by a nun shortly after the Council of Trent, so you see, quite a few centuries ago. This apparition is thoroughly recognized by Rome and the ecclesiastical authorities; a magnificent church was built for the Blessed Virgin Mary wherein the faithful of Ecuador venerate with great devotion a picture of Our Lady, whose face was made miraculously. The artist was in the process of painting it when he found the face of the Holy Virgin miraculously formed. And Our Lady prophesied for the twentieth century, saying explicitly that during the nineteenth century and most of the twentieth century, errors would become more and more widespread in Holy Church, placing the Church in a catastrophic situation. Morals would become corrupt and the Faith would disappear. It seems impossible not to see it happening today. Hence, the Archbishop believed that the prophecy may have been about him. However, I propose that the Holy Prelate prophesied by Our Lady of Good Success was not Archbishop Lefebvre; rather, Our Lady was referring to a prelate yet to come. As the basis of my argument, I shall use the biography written by a Fr. Manuel Sousa Pereira in 1790. This excellent biography has been approved by the Church as a source of evidence in the process of canonization of Mother Mariana. It has been translated from the original Spanish into English by Marian T. Horvat and is available from Tradition in Action in two volumes (Volume I and Volume II). The Royal Convent of the Immaculate Conception was founded on January 13, 1577 in Quito. The spiritual and temporal government of the religious (Conceptionists) was entrusted to the hands of the Rev. Father Antonio Jurado, O.F.M. (Volume I, p. 32). Some time between 1593 and 1599, the Friars Minor prudently decided to step away from the direction of the Convent due to some troubles with certain sisters. They did not, however, renounce their complete jurisdiction (Volume I, p. 97). It was not until 1601 that the complete separation of the Friar Minors from the convent took place (Volume I, p. 99, footnote 30). Ever since that time, the convent has been under the jurisdiction of the diocesan bishop. “The separation of the Friars Minor has taken place by divine permission. Woe to those who openly worked to obscure the light of my Convent! But after some centuries, they will return to govern this beloved flock, which will always lament their absence and feel their loss. “….But a golden area will come to this my Convent. Then a Prelado (prelate), my most beloved son, blessed and prized before God, will understand by divine light the necessity for the daughters of my Immaculate Conception to subject themselves in exact obedience to the Friars Minor for their sanctification and perfection. This Prelate will ask my Vicar of my most Holy Son here on Earth to restore the jurisdiction over this Convent to the Friars Minor” (Volume I, pp. 143-144). In this message, we read that the Holy Prelate will restore the jurisdiction over the convent back to the Friars Minor. As mentioned above, this has not happened yet. And Archbishop Lefebvre died in 1991. Our Lady, therefore, was not referring to Archbishop Lefebvre. “In this epoch (our time), the Secular Clergy will be far removed from its ideal, because the priests will be careless in their sacred duties. Losing the divine compass, they will stray from the road traced by God for the priestly ministry and they will become attached to wealth and riches, which they will unduly strive to obtain. “How this Church will suffer on that occasion the dark night of the lack of a Prelate and Father to watch over them with paternal love, gentleness, strength, discernment, and prudence. Many priests will lose their spirit, placing their souls in great danger. “Pray insistently without tiring and weep with bitter tears in the secrecy of your heart, imploring our Celestial Father that, for love of the Eucharistic Heart of my Most Holy Son and His Precious Blood shed with such generosity and by the profound bitterness and sufferings of His cruel Passion and Death, He might take pity on His ministers and quickly bring to an end those ominous times, sending to this Church the Prelate who will restore the spirit of its priests” (Volume II, pp. 212-213). Now Archbishop Lefebvre did indeed restore the spirit of many priests after the calamitous Second Vatican Council. However, he did not do so on a grand scale as virtually every priest worldwide adopted the reforms of the Council, especially the Novus Ordo Missae, and remain attached to them to this very day. Furthermore, the Archbishop’s work did not “bring to an end those ominous times”; rather, the Church as a whole has gotten worse since the Council and is currently in the worst state under Pope Francis than it has ever been. History shows that the Archbishop’s work was more related to the preservation of the Church than to its restoration. The Holy Prelate’s work, on the other hand, will be that of a full restoration. “The lukewarmness of all the souls consecrated to God in the priestly and religious state will delay the coming of this Prelate and Father. This, then, will be the cause of the cursed Devil taking possession of this land (Ecuador), where he will achieve his victories by means of a foreign and faithless people, so numerous that, like a black cloud, it will obscure the limpid heavens of the then-Republic consecrated to the Most Sacred Heart of my Divine Son. “With these people, all the vices will enter, which will attract in their turn every type of chastisement, such as plagues, famines, internal fighting and external disputes with other nations, and apostasy, the cause of the perdition of so many souls so dear to Jesus Christ and to me. “In order to dissipate this black cloud that prevents the Church from enjoying the clear day of liberty, there were will a formidable and frightful war, which see the bloodshed of countrymen and foreigners, of secular and regular priests and also of religious. That night will be most horrible, for, humanly speaking, evil will seem triumphant. “This, then, will mark the arrival of my hour, when I, in a marvelous way, will dethrone the proud and cursed Satan, trampling him under my feet and fettering him in the infernal abyss. Thus the Church and Country will finally be free from his cruel tyranny” (Volume II, pp. 213-214). Note that this time of trouble occurs after the time of Garcia Moreno, who consecrated Ecuador to the Sacred Heart of Jesus, as Our Lady says that “it (the time of the Devil taking possession of Ecuador due the lukewarmness of consecrated souls) will obscure the limpid heavens of the then-Republic consecrated to the Most Sacred Heart of my Divine Son“. Therefore, Our Lady is referring to a period after the period of relative prosperity in Ecuador that resulted from the consecration. However, Our Lady added that She will finally free the Church and Country from the Devil’s cruel tyranny. This has yet to happen, but when it does, Our Lady will have the co-operation of the Holy Prelate. With the impending formal apostasy of Rome, the death of Archbishop Lefebvre, the betrayal of the SSPX leadership, and the two Resistance bishops adopting the impotent “loose association” model, is there any doubt that we need the help of the Holy Prelate now more than ever? No! Let us then implore Our Lady of Good Success to send him to us soon. 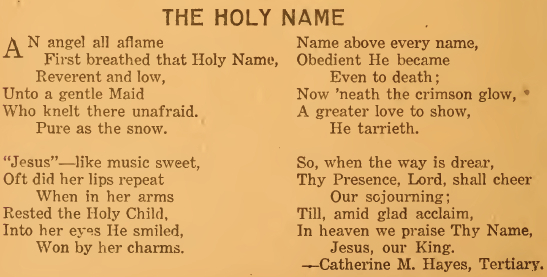 This poem was taken from the September 1919 issue of the Franciscan Herald. This story was taken from the March 1919 issue of the Franciscan Herald.